Scotland's political parties have been reflecting on their respective performances in the UK General Election. After losing five seats since the 2001 poll, Labour vowed to listen to the electorate and act on their concerns. Nationalists said their six MPs would continue to pressure Tony Blair over the Iraq war. The Lib Dems hailed their gains as "a great result" and the Tories described their solitary seat as "remarkable". 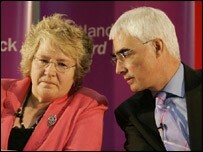 Scottish Secretary Alistair Darling hailed the "historic achievement" of a third consecutive term for Labour. However, the MP who won Edinburgh South West with a comfortable majority of more than 7,000, said he accepted that people wanted the government to do more for them. He said: "I believe there is an opportunity to learn the lessons of what the electorate are saying. "We need to do more and we need to do better. We also need to listen to what the people are saying." Mr Darling said the Tories had made "no progress in Scotland at all", merely swapping one seat for another "and being comprehensively rejected". He went on: "People want to see a continuation of the economic success delivered by Tony Blair and Gordon Brown - but they are also clear they want us to do more. "And they are also clear that they want us to listen to their concerns and act on them, and we will." Scottish Labour leader Jack McConnell said the results were "a strong reminder" from voters north of the border for a need to listen, learn and make quicker progress. Mr McConnell said the election had proved "a complete disaster" for the Tories and the SNP, while the Lib Dems were shown to be "an appropriate vehicle protest". Scottish National Party leader Alex Salmond was in bullish mood about its election performance, which saw it gain six seats at Westminster. Speaking at a news conference in Edinburgh, he said the SNP had won seats from Labour for the first time in 31 years, with success in Dundee East and the Western Isles. Mr Salmond said: "The central message of this campaign is that we will march on Holyrood and we will be marching to victory." The Scottish Lib Dems said they had gained the most Scottish MPs and second place in the vote for the first time since the 1920s. Jim Wallace said he was the Scottish party leader with the biggest smile on his face. He added: "It's been a great result for the Scottish Lib Dems and indeed the best result for our party in over 80 years." Dumfriesshire, Clydesdale and Tweeddale was won by the Tories, but the shadow Scottish secretary Peter Duncan lost out. 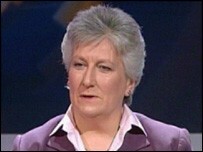 The party's sole Scottish MP in the last parliament was defeated by Labour in Dumfries and Galloway. Deputy Scottish Tory leader Annabel Goldie said the victory for David Mundell in the neighbouring seat was "a marvellous result". She said the party had nothing to be ashamed of as it had "held its own and consolidated its position". Ms Goldie added: "I think what yesterday's election was all about was actually prising the cement out of the foundations of the Labour government structure. "Already a number of us are looking first of all to Scotland in 2007 and then with considerable interest at what will be the next general election. "I think that one seat is a very remarkable achievement. The pollsters and experts all predicted that the Conservatives would win no seats whatsoever. "Naturally, we're disappointed with the loss of Peter Duncan and we're certainly disappointed that we could not have advanced and kept one seat and taken another to give us two but we work with the reality of where we are."